Riding lovers invites you all on a Royal Rajasthan motorcycle tour in the colorful state of Rajasthan. Riding lovers assures you that the attraction of the Royal Palaces, the historic forts, the lakes, desert festival and International Camel Festival. Riding lovers invites you all on a Royal Rajasthan motorcycle tour in the colorful state of Rajasthan. Riding lovers assures you that the attraction of the Royal Palaces, the historic forts, the lakes, desert festival and International Camel Festival. You can bring your own motorcycle or rent one from Riding lovers. This motorcycle tour is a true pleasure for any traveller who wants to explore India. Rajasthan is one of the most visited states in India. it is famous for legends of chivalry, heroism & royalty of Rajput. 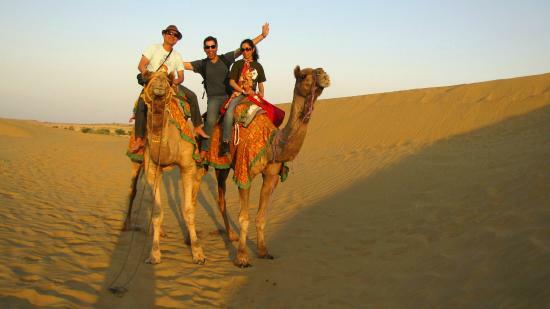 Here you explore the Wild-life sanctuaries, Camel Ride in Soft Sand Dunes, Fair & Festivals & Magnificent Forts. There is no point coming to the Thar Desert if you don't go for the Desert Safari. That is why Sam sand dunes are becoming the major attraction in Jaisalmer. This is the closest place from where you can loose yourself in 'the Great Thar Desert'. 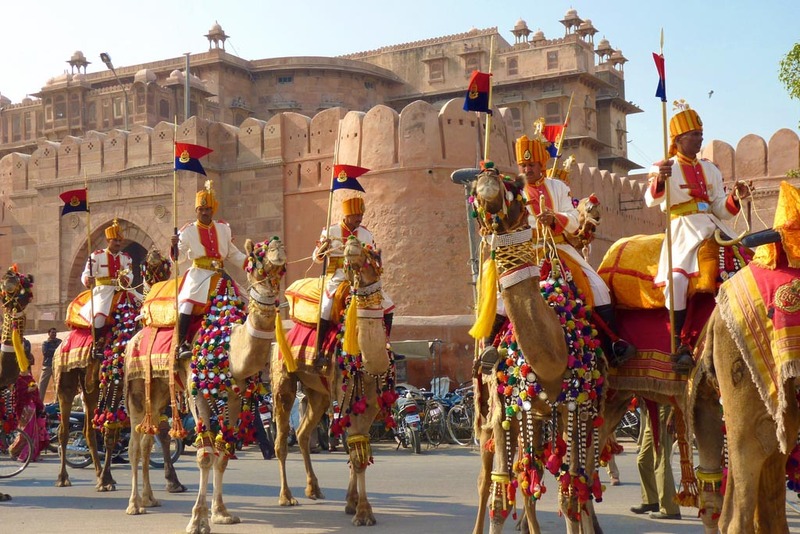 This festival is celebrated each year in Bikaner in January and is very significant to the people of Rajasthan because in early times there were no automobiles and then camels were the only source of transport. This is the orientation day. This day is a very important day as the group gets the briefing regarding the entire tour. The riders are introduced to each other and are open to asking any of the queries to the tour leader. Do's and don't's are also not to miss. The ride will start early morning to avoid the Delhi traffic. The ride begins towards Bikaner. This is one of the best roads of the entire tour and the riders love it. In the afternoon, the visit to Junagarh Fort will be a historic experience. Overnight in hotel. You will go to visit the International Camel festival, famous Karni Mata Temple. This temple is famously known as the ‘Rat Temple’. In the evening, you will visit the colorful local market of Bikaner. Overnight in Bikaner. After breakfast, get ready to ride on an awesome route for a motorcycle trip through small villages set among desert oasis with deep blue vast open skies above to the horizon of golden sands. Wild camels and caravans of gypsies drift by as you will virtually alone on the roads through the desert. Your destination for the next two nights is the fantastic Ali Baba “Golden Fortress City” on the Pakistan - India border in the Thar Desert, Jaisalmer. On arrival in Jaisalmer, Overnight in hotel and relax. This morning after breakfast, start your sightseeing of Jaisalmer including the old town of Jaisalmer and visit Jaisalmer Fort that's built in the year 1156 by Rawal Jaisal. Perched on 80 meters high hill, housing the entire township within its ramparts, it is the only "Living Fort" in India. After that, you will ride down 40 kilometers away from Jaisalmer through huge sand dunes on both sides of the road which gives you an awe-inspiring experience of motorcycle tour in Rajasthan. En-route, visit an abandoned village Kuldhara, popularly known as Ghost Village. Later, the ride continues to Sam Sand Dunes. On arrival at Sam Sand Dunes en-suite camping site, check in camp and relax. After tea, enjoy a camel ride in soft sand dunes of Thar desert and the panoramic view of the sunset from the middle of Sand Dunes. Later, back to camp and enjoy mouth watering Rajasthani dinner with folk dance and music program by a group of talented folk artists. Overnight in the camp. After breakfast, with beautiful memories of Sam sand dunes ride to Barmer. Barmer is famous for its historic monuments and the temples which are located in the region. Barmer city houses number of such temples which attract tourists from all over the country. The city is very famous for the temple of Goddess Jagdambe. It is an ancient temple and the archaeologists suggest that the temple is as old as 500 years. The Jagdambe Mata temple is located at a height of around 140 m above plain land. Another temple worth a visit is the old ‘Chintamani Parshvanath Jain’ temple which is believed to be one of the oldest Jain temples of the area. It was built by Shri Nemaji Jivaji Bohra in the 16th century. Also visit Kiradu temples. Overnight in hotel. This ride will start early in the morning. Kutch District is surrounded by the Gulf of Kutch and the Arabian Sea in south and west, while northern and eastern parts are surrounded by the Great and Little Rann (seasonal wetlands) of Kutch. Overnight in Hotel. we visit The Great White Rann, kala dungar overnight in Hotel or camp. After breakfast, we start ride to Udaipur, also known as the "City of Lakes," the "Venice of the East," or the "Kashmir of Rajasthan. Later we visit The City Palace. The palace now houses a museum with many antique articles, paintings, decorative furniture and utensils from the royal era. We also visit Jag Mandir. Jag Mandir is a palace built on an island in the Lake Pichola. Also known as the "Lake Garden Palace. And Last FatehSagar Lake and Lake Pichola. The lake's surroundings and the several islands within the lake have been developed over the centuries, with palaces, marble temples, family mansions, bathing ghats. Enjoy the sightseeing of Jodhpur on a motorbike to a hill to visit the Mehrangarh Fort (Majestic Fort). View of the city from the top of the fort is just incredible. Nearby, visit Jaswant Thada (also known as Taj Mahal of Jodhpur), a cluster of royal cenotaphs in white marble built in the year 1899 AD. In the Last, visit to Ummed Bhawan Palace. Overnight in Hotel. In the morning and after breakfast, you will ride towards Jaipur. Jaipur is also called “Pink City” because many buildings are still washed in pink, the traditional color of welcome. Upon arrival in Jaipur, check in at your hotel and relax. Enjoy the sightseeing in Jaipur including the 16th century’s Amer Fort with elephant ride. After that, visit the magnificent City Palace (Royal Museum) which is built in 1,727 by Maharaja Sawai Singh. The complex consists of an excellent museum, armory, sprawling gardens, buildings, and several fine halls, including Jantar Mantar (the astronomical observatory) and Hawa Mahal (palace of winds). Overnight will be at the hotel in Jaipur. Your 12 night accommodation will be on twin or triple sharing bases in standard hotels / tents / camps with breakfast & dinner. Please note that the accommodation on your arrival and briefing day in Delhi is not included. Experienced Royal Enfield mechanic with all necessary spare parts for bikes including his accommodation & food. Back-up Vehicle (Support Car/Van) for your Luggage & Pillion Rider. Any personal expense(s), medical expense(s), Incidental expense(s), Special request(s), All other shopping / cost incurred, Insurance, Tips, Porters, Phone Calls, Laundry, Mineral Water. Horse, Pony, Monument / Museum / Park Entry Charges. Camera & Video Camera Fees. Any Kind Of Expenses For Loss / Misplaced / Theft On Personal Belongings. Any Kind Of Extra Meals / Drinks Ordered. 30% - Deposit per person required when online booking with RL as advance money to ensure that you’re joining one of our motorbike tours. Balance payment is to be made 25 days prior to the date of start of services. Any booking made within 25 working days of the date of services would be considered to be a late booking and for same the full and final payment is required to be made at the time of booking itself. 29 days to 15 days prior to arrival - 30% of the tour/service cost. 14 day and less prior to arrival or no show – NO REFUND. Aid KIt, Exp. Mechanic, Guides. We are seeking your information because after getting your details, we will be contact you and discuss our pricing and plan.